JINZHOU GUANGYA METAL PRODUCTS CO., LTD, Vadi un kabeļi - tērauds, Prekyba juodosios metalurgijos produktais, Steel Fiber, EUROPAGES. 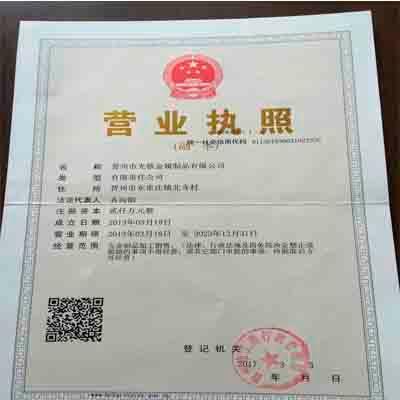 Jinzhou Guang Ya metal products Co., Ltd was founded in 1995. After a series of development and transformation, the company built a new modern production company in 2013. The company is located in the Jinzhou Beisi Industrial Park. The company has a total investment of RMB 240 million, with a total annual GDP of more than RMB three hundred million and more than 180 employees, including more than 10 senior engineers, more than 10 expert personnel and 20 technical personnel. The company mainly produces: steel fiber, electric galvanized wire, hot dip galvanized steel wire, galvanized wire environmental protection, annealed wire, etc., annual production capacity of 200000 tons, the product exports accounted for more than 80%, are exported to the United States, Russia, Europe, Africa, southeast Asia and other countries. Over the years the company has been focused on career development, and response to the state environmental protection policy, the introduction of new production equipment and establish the corresponding environmental protection facilities, energy conservation and emissions reduction, and strive to operate in their own fields do more professional is better. With the tenet of "integrity, innovation and reaching", the company adheres to the professional ethics and continuously promotes the core competitiveness of the enterprise, which enables the enterprise to be in an advantageous position in the fierce market environment.